I am the last person on Earth who likes to mix contemporary music and Christmas-themed music. Despite the fact that I am a metalhead, I like my holiday music the old-fashioned way – recorded years and years ago (preferably recorded before I was born). So, as you can imagine, I found myself having a hard time even getting The December People's "Sounds Like Christmas" into the CD player. But once I did, I realized I may have to alter my impression of contemporary holiday music. "Sounds Like Christmas" almost works in spite of the fact that these are holiday songs. 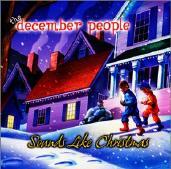 The December People have taken holiday classics and given them new shape and vibrant life by adding ambient, melodic, and progressive elements that makes it sound unlike any other holiday album you’ve likely ever heard. Nearly all of the tracks use traditional holiday music, albeit with added musical elements and lyrics to fit contemporary times. The tracks are strong throughout even if they don't fit into my historical view of what holiday tunes should be about. There are no weak moments on "Sounds Like Christmas." Simply put: fans of prog rock with a soft spot for the holiday season will love The December People's "Sounds Like Christmas." I have also learned that The December People supposedly have a history that goes back to the early Seventies with a long list of holiday-themed material and label/legal problems that would likely crush lesser bands. Unfortunately, much of their older material remains obscure due to the issues that have been dogging the band lo these many years. The December People are keeping a secret as to whom they really are. Supposedly they're well-known and it would blow your mind if their identities were revealed. Just as the mysteries of the holiday fables keep millions of youngsters in awe of the winter season of giving so, too, do The December People keep their identities a mystery to maintain the magical awe of the holiday season. Joining The December People are vocalists Robert Berry, Steve Walsh (Kansas), John Wetton (King Crimson, Asia), Trent Gardner (Magellan), Mike Baker (Shadow Gallery), Jake Livgren (Kansas), Lisa Bouchelle (Mastermind), and Gary Wehrkamp (Shadow Gallery). For more information visit http://www.magnacarta.net. Revised: 15 Jul 2018 12:47:50 -0400.